Welcome to 2147 where, in the words of Leonard Snart, there is "no litter, no street crime, no smog" (where everybody wears Star Fleet-esque clothes) and Vandal Savage is tutoring a young prodigy that will one day release a terrible virus and destroy the world! Oh, and there are killer robots circling the skies to create "peace." Aka, 2147 is not a nice place to be. How did the Legends try to stop Savage this time? Find out here. To the Wave Rider! I think this has been the first episode that truly felt like a "filler" episode. While the concept of going to the future to stop Savage's rise to power was intriguing, the execution was poorly done. Again. I understand the members of this ragtag group aren't heroes or super fabulous, top picks for the super hero playground, but I was hoping that after ten episodes they would have learned something and become a little bit smarter in their choices. Instead, they continue to follow after Rip's every whim. For instance, in what story is kidnapping a young boy, who is supposedly the "Future Adolf Hitler," ever a good idea? Don't they realize by kidnapping him, they probably will usher in his reign as world terrorizer? I was hoping that they would actually listen to Jax for once and maybe not try to kill the future Hitler or drop him off in the middle of nowhere but actually talk to him. I had hoped that would have at least turned the tables on the typical "changing history" trope. But alas, I was not given something new--but something seen many times before. Sara: "It's not too late for Per Degaton to change." Sara: "Says someone with two tours with the League of Assassins and a case of bloodlust under her belt." However, other than that disappointment, the rest of the episode was actually a bit fun. The character interactions made me laugh. The events were interesting to see unfold. And the ending left me wishing it was Thursday already. Rip showed a lot of merit, surprisingly, in this episode. He apologized to Mick Rory, finally. His plan to kidnap Per Degaton was actually pretty cool to watch. (Side note: I had no idea the boy's name was spelled like that. The entire episode, every time someone said his name I just sat there with an expression that read ???? It was very enlightening to see it spelled out.) And his speech to Per Degaton about goodness was golden. I was impressed with his motive. I wasn't sure if he would actually kill the boy, but it was actually refreshing to see him try and then realize he can't. Rip: "I've said to myself time and time again that there is nothing that I wouldn't do to save my wife and son, but now I know that there is. My reticence to kill you, Per Degaton, is not weakness. It is goodness. And if there is a shred of goodness inside of me, then I have to believe that there is a shred of goodness inside of you. Be the man that your father wants you to be, not the man Savage wants you to be." Sara and Snart teaming up is always my favorite thing. Pairing a former assassin with a former criminal full of sass is always fun. I love their relationship, whatever it is. Sara trying to get Rory and Snart to make up was a nice side story for the episode and pretty much what I live for with this show. Not only is it an actual privilege to have Sara talk to Rory, but to see her sticking up for Snart just made the scene so much better. As for Snart, his lines will always be my favorite. 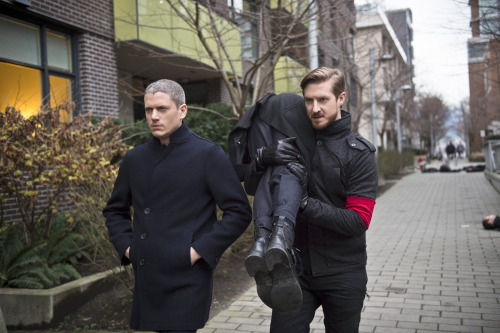 Snart: "Are you telling me future Hitler is enrolled in a gymnastics class?" I think the writers did an A+ job when they had Snart finally confront Rory about what happened between them. The whole scene just deserves something. I was stoked when they decided to duke it out to the death. It fit them perfectly. But it was also very fitting that Rory wouldn't kill Snart because something worse was coming anyways: the hunters. (Now, if you're going to introduce a big bad team of assassins, I would suggest not naming them "the hunters." It just doesn't sound that intimidating.) However, the fact that not only did they not stop Savage but they also ushered in the terrible, future events sooner than expected and they've got a squad of cold-hearted assassins on their tail: well, this is going to be one exciting ride for the rest of the season! Ray: How is it even possible that I'm someone's great-great-great-great grandfather? Before we left in 2016, the only person I was ..."
Ray: "Ghosted me the week before we left." Jax: "No, no, ghosting. It's where you pretend to be dead by not answering somebody's text." Stein: "What a strange age for dating." Kendra: "You know what I love about you, Ray, is you always manage to find the bright side. And no matter what, you never give up. So please don't give up on us." Ray: "I'm not giving up, but it's hard to ignore the math. You and Carter have spent lifetimes together, and in each one, you've fallen in love, so why would this lifetime be any different?" Kendra: "Well, I never met you before. Look, Ray, Carter is my past. You are my future." Despite that some of the plot felt like a filler episode, I enjoyed this episode immensely. As I've said before, I'm not here just for the plot. I'm here for the characters. And this episode rocked on bringing characters together and giving them moments to become better. The whole show is a journey for each of the nine main characters, and watching each of them deal with a situation and add it to their arc is one of the best aspects of the show. It weaves them all together to become the Legends they are. What did you think of "Progeny"? React with me in the comments below!